While we don't breed any longer, we still own Berners and love the breed. This site is kept active to archive our time with the breed and to show lots of photos and maintain historical information. Since we no longer breed, please don't contact us about puppies. Welcome to the du Coeur Bernese Mountain Dogs web site. Here, you can stay up-to-date on all our wonderful Berners. And, there is lots of useful information about Berners plus links to other resources. 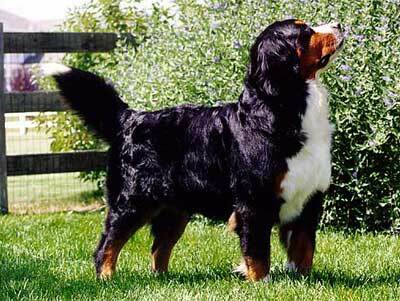 The du Coeur Bernese Mountain Dogs kennel is owned by Lynne and Rick Robinson. We've owned Bernese since 1984. Our first Berner was Manda, whom we bought while living in Germany in the mid-80s. Since then, we've owned more than a dozen other Berners, each with their unique personality. On this web site, you can see many of those dogs and learn more about them. Just click on a topic on the left-hand side of this page for more information about it. Note: much of this site is graphics intensive with lots of photos and is best viewed over a broadband connection (or with patience).